The Carolina Hurricanes put up five goals yesterday on the Philadelphia Flyers, winning their second straight and climbing within just a single goal of 100 on the season. They are one of only two teams (along with the Los Angeles Kings, who sit at 94) without 100 goals this year, a result of some very inconsistent play from their forward group. One player who prior to this season was lauded for his consistency at both ends of the rink is Jordan Staal, who unfortunately was placed back on injured reserve today with an upper-body injury. The former Carolina captain had missed time with a concussion in December before returning for just two games prior to the Christmas break and hasn’t suited up since. In his place, the team has recalled minor league forward Greg McKegg under emergency conditions to give them an extra body up front. More importantly though, Haydn Fleury has been sent back to the AHL. The young defenseman has also been out with a concussion, missing the team’s last nine games. His assignment likely means that he’s ready to get back into game action, and the team will give him the chance to prepare in the minor leagues. Fleury, 22, has played just ten games for the Hurricanes this season and finds himself fighting for a spot on one of the most crowded blue lines in the NHL. Despite the Hurricanes’ unimpressive 17-17-5 record, they still have an enviable group of defensemen that includes Jaccob Slavin, Dougie Hamilton, Calvin de Haan, Brett Pesce, Justin Faulk and Trevor van Riemsdyk. That’s not even mentioning the other young options like Jake Bean and Roland McKeown who are pushing for spots, giving Fleury more than enough competition to endure even without factoring in a head injury. If the Hurricanes ever do consider trading one of their prized defensemen, there is no shortage of players ready to seize the opportunity and show they are full-time NHL players. Fleury will have to wait for that chance with the others in the minor leagues for now. Another busy day on the waiver wire as 15 players were placed on waivers today, according to TVA’s Renaud Lavoie (Twitter link). No players was claimed from yesterday’s group of 16 players, but with the regular season fast approaching, teams are continuing to make big decisions. There are a few interesting names, including the “Hamburglar,” who lost his bid to unseat goaltender Alex Stalock as the backup goaltender in Minnesota. Hammond hasn’t been a full-time backup since the 2015-16 season, but has shown flashes of brilliance when he’s hot, including getting into three playoff appearances for Colorado last year. One of those games, Game 5, Hammond stopped 44 of 45 shots in leading the Avalanche to a 2-1 victory over the Nashville Predators. However, he wasn’t able to keep that success going as he yielded five goals the following game as Colorado was eliminated. The 23-year-old Bailey is another interesting player who has worked his way up level-by-level and was on the border of a regular spot. Bailey has had three stints in the NHL now and last year’s was one of the more successful ones has he tallied three goals and four points in 12 games. Baptiste is another 23-year-old in Buffalo, who got an even longer look with the Sabres, 33 games, but only managed four goals in that time. Read is another player with tons of experience. The 32-year-old had played quite a bit in the NHL before struggling to get playing time in Philadelphia, while the 25-year-old Rau posted 23 goals in Iowa last season in the AHL. Greg McKegg didn’t file for arbitration before the deadline last week, but he’ll be playing for the Carolina Hurricanes organization anyway in 2018-19. The team has reached a one-year, two-way deal with the restricted free agent forward worth $715K at the NHL level according to Renaud Lavoie of TVA Sports. McKegg, 26, played 26 games for the Pittsburgh Penguins last season before eventually being shipped to the Hurricanes for Josh Jooris. Adding McKegg made an immediate impact for the Hurricanes’ AHL affiliate, scoring 23 points in 19 games for the Charlotte Checkers, a level of offensive production never really seen before in his career. They’ll hope that he can bring that same scoring touch next season if he doesn’t make the NHL squad. Making that squad will be tough even after the team traded away some of their center depth in Elias Lindholm and Marcus Kruger, as the team will likely be adding Martin Necas, Andrei Svechnikov and Janne Kuokkanen to the forward group on a full-time basis. Even if that doesn’t happen for all three, McKegg will be at best a depth option for the team next season and should see time with the Checkers. He is waiver eligible, but after clearing last season for Pittsburgh it’s unlikely he would be claimed. Free agency is now a little less than a month away from opening up and there are quite a few prominent players set to hit the open market while many teams have key restricted free agents to re-sign. Here is a breakdown of Carolina’s free agent situation. Key Restricted Free Agents: F Elias Lindholm – The Hurricanes weren’t able to find much success in terms of wins and losses in 2017-18, and much of that had to do with some inconsistency from nearly every position. One of the only players that has been able to find some of that consistency through his first few years in the league is Lindholm, who went about another 40-point season with solid contributions in the faceoff circle and the penalty kill. If the team were to acquire a real first-line center Lindholm would likely be pushed down in the lineup, but he’s proven that he can be an impact player that doesn’t hurt you at either end of the ice. He’s coming off a two-year $5.4MM contract that he signed in 2015, and should get a healthy raise after recording 89 points in 153 games. Where that number lands isn’t exactly clear, but one could look at teammate Victor Rask’s six-year $24MM deal as a point of comparison. Rask was also 23 at the time of that contract, though he didn’t have nearly as much NHL experience as Lindholm heads into this summer with. D Noah Hanifin – The bigger question mark among Carolina restricted free agents is Hanifin, who could either be locked up long-term or shipped out of town. The rumor mill has swirled around the 21-year old defenseman for the past year, mostly because of the Hurricanes’ depth on defense. Hanifin would generate a ton of interest around the league and bring in a big package for the Hurricanes, but could be more useful stepping into a bigger role on the team next year and beyond. While it’s clear that Carolina will move at least one of their defenders, that could Justin Faulk with Hanifin instead being signed to a long-term deal. No one can really get a read on owner Tom Dundon and GM Don Waddell, but there are clearly changes coming in Carolina. Hanifin will be an interesting measuring stick to see just how far the new executive group wants to go in shaking up the core of the team. 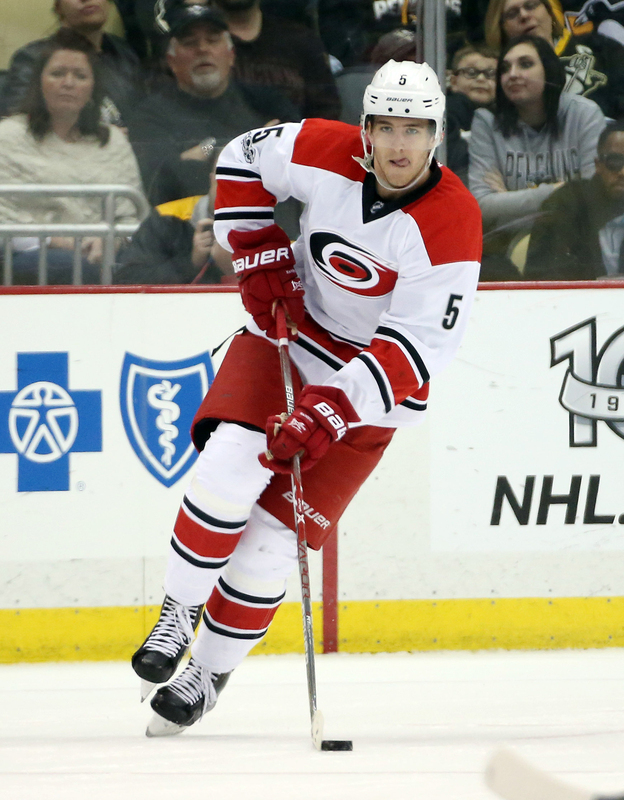 Key Unrestricted Free Agent: F Derek Ryan – Though Carolina needs some center help, it looks as though Ryan is destined for free agency as the team prepares to promote Martin Necas to the big club next season. Ryan, 31, has been a sneakily-good player since making his NHL debut at the age of 29 two years ago. With 38 points in 80 games this season and solid faceoff and possession statistics, there will be interest from around the league in the professional journeyman. Heading to a new team is nothing new for Ryan, but he’ll likely be looking for a multi-year deal that can keep him in one place for a few seasons. After re-signing with the Hurricanes for just under $1.43MM last summer, there could be a hefty raise in order this time around. Ryan heads to free agency in a relatively weak center market, as after John Tavares and perhaps Joe Thornton, options get thin very quickly. Projected Cap Space: The Hurricanes have never been an upper-limit team, and head into this summer with more than $30MM in cap space depending on where the ceiling lands. While that should afford them the opportunity to be big players in free agency, it really comes down to how much Dundon is willing to spend in his first offseason. The team has previously worked under an internal budget that has limited big free agent splashes, but with a new owner in the mix the Hurricanes are something of a wildcard. Their restricted free agents should take up a big chunk of that cap room, but there is certainly enough to go around if they decide to wheel and deal. They’d have to pitch any incoming free agents on a new Carolina organization, but with up-and-coming players and a veteran leader in Justin Williams on the roster, perhaps they could draw the attention of some of this summer’s biggest names. Even though the deadline has technically passed, trades will still leak out over the next hour. Josh Jooris has been acquired by the Pittsburgh Penguins from the Carolina Hurricanes, the Penguins announced. Heading to the Hurricanes is AHL center Greg McKegg and Jooris has been assigned to the AHL’s Wilkes-Barre Scranton Penguins to replace him. An undrafted forward out of Union College, Jooris has carved out a role in the NHL for the last several years as a high-energy fourth line player. With 55 points in 204 career games, he won’t be relied upon for anything more than his usual role, but does give the team some NHL experience in the minor leagues in case injury strikes down the stretch. McKegg was given a chance as the fourth-line center earlier in the year with Pittsburgh, but was pushed down the depth chart after they acquired Riley Sheahan. Now after adding Derick Brassard as well, his chances of making an impact with the club down the stretch were very slim. He’s off to the fifth organization of his short career, after being originally selected in the third round by the Toronto Maple Leafs in 2010. The Pittsburgh Penguins have placed forward Greg McKegg on waivers today, after registering just four points in 26 games. The Penguins need a roster spot for an extra defenseman after Justin Schultz was injured yesterday. There’s no guarantee that McKegg is assigned to the minor leagues, but it is likely. McKegg has been a full-time center for the Penguins until recently, but even when he was in the lineup hasn’t seen the ice very much. Averaging fewer than 10 minutes a night, he does contribute some on the penalty kill and has already nearly matched his career-high in goals this season. A former prospect of the Toronto Maple Leafs, McKegg has bounced around since being traded for Zach Hyman in 2015. The Penguins are still out looking for help down the middle, which would eventually move McKegg out permanently. For now they’ll stick with Carter Rowney in the fourth-line role, but would likely rather Riley Sheahan to slide down after acquiring a different option for the third group. McKegg is no stranger to waivers, having been placed their a handful of times throughout his career. The 25-year old could be claimed by another club looking for some depth at center ice, as he is on a minimum two-way deal and wouldn’t hurt a salary cap.